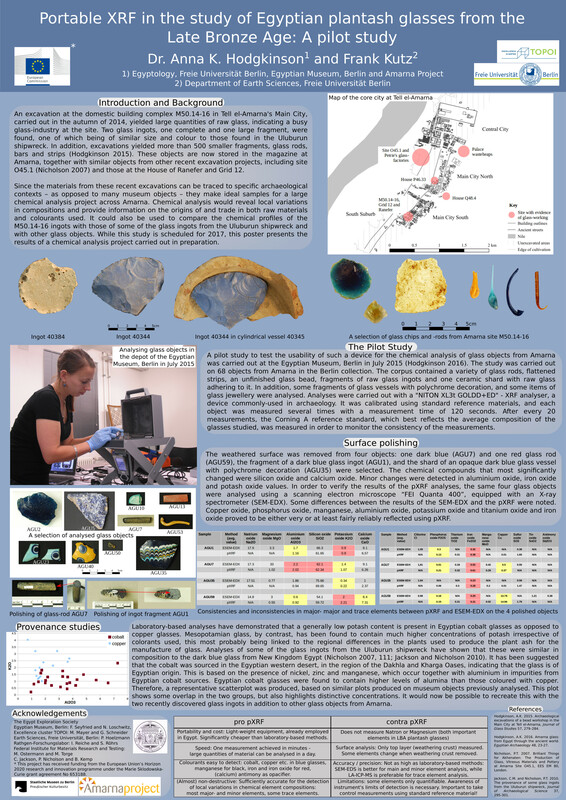 The project combines archaeological and archaeometrical methods, in order to examine the variations in the chemical fingerprint expressed by the various cobalt sources and to test their homogeneity across Amarna. This may shed light on trade and control networks of cobalt ore, and interactions within and between individual workshops. Non-destructive chemical and optical analysis, partially using fixed laboratory equipment, but also portable devices, will provide data for the large quantities of archaeological material from earlier and recent excavations. In addition, the artefactual and chemical data will be mapped and analysed, using a database and Geographical Information Systems (GIS) in order to determine distribution and control patterns, leading to an in-depth understanding of Late Bronze Age (LBA) Egyptian glass-working. This bottom-up approach, which has not been carried out on the proposed scale will close a gap in our knowledge of LBA socio-economic processes in an urban environment, in particular with regard to the chaîne opératoire of craft production and its organisation. 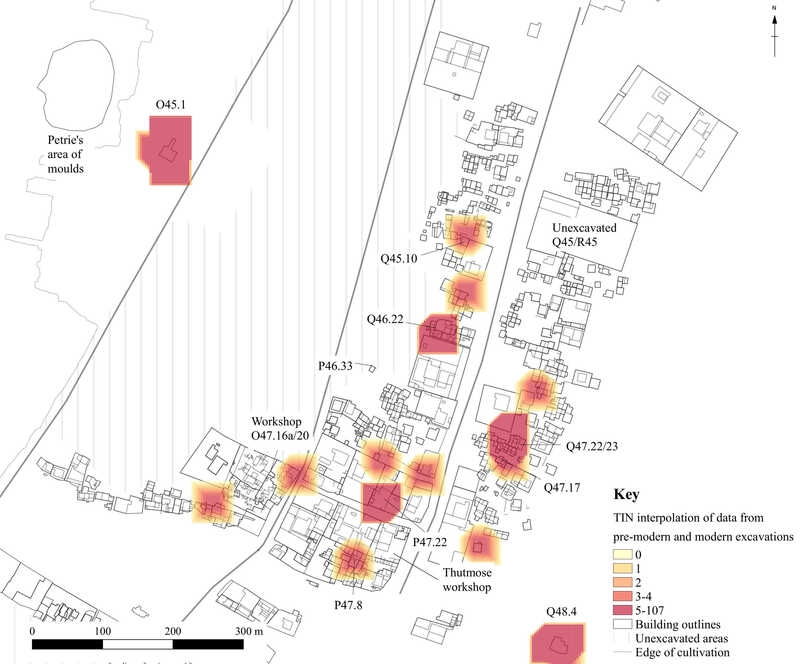 In 2014 and 2017 I led an archaeological fieldwork project at Tell el-Amarna, which encompassed the (partial re-) excavation of a complex of houses at site M50.14-16. This area was a known glass-workshop, but both the publication and the old excavation records from 1922 did not yield much further information about the nature of the workshop and its organisation. 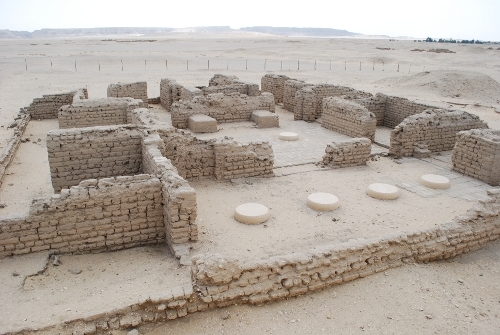 In order to find out more about how domestic glass-working took place at Amarna and the whereabouts of a possible kiln, an area of more than 500 square metres was excavated, and a large number of finds relating to glass-working, but also to the manufacture of faience, stone and metal, were found. More can be read here. The finding of such numerous objects from glass is of relevance in the greater picture of Amarna glass industries. Therefore, it is of great interest to establish knowledge about the chemical compositions of the glasses found in modern times throughout Amarna. Since it is impossible to analyse the objects from Amarna elsewhere, it is envisioned to bring a portable X-ray fluorescence (XRF) machine to the site and to measure the objects without removing or destroying them. The Egypt Exploration Society have kindly funded a pilot project, which will test the suitability of such equipment for the analysis of Late Bronze Age plantash lime-soda glasses. A report on this work can be read in Egyptian Archaeology 48. Until September 2017 I held a Marie Skłodowska-Curie post-doctoral fellowship based at the Freie Universität Berlin and the research cluster TOPOI, in partnership with the Egyptian Museum and Papyrus Collection in Berlin and the Amarna Project. My research project is entitled Glass, Faience and Food in Late Bronze Age Societies: An Analysis of the Socio-Economics of Urban Industries in Egyptian and Mesopotamian settlements. I have recently organised an interdisciplinary workshop on Approaches in the Analysis of Production at Archaeological Sites, which took place in Berlin on 20-21 January 2018. The workshop was the final deliverable of my recently completed Marie-Curie project. A keynote lecture was delivered by Prof. Cathy Costin on the subject of "Locating Craft Production: Space and Place". My PhD thesis (University of Liverpool School of Archaeology, Classics and Egyptology 2014) has recently been published as a monograph, Technology and Urbanism in Late Bronze Age Egypt. The book discusses the production and consumption of luxury goods within the Royal cities of New Kingdom Egypt (c.1550-1070 BC), with particular emphasis on such cities' roles within the economy of the state. The sites discussed are Amarna, Gurob and Malqata, while Qantir/Pi-Ramesse features for comparison. All of these settlements contain evidence of high-status industrial activities, and thus it can be argued that this contributes to the legitimation of the cities' status. The book can be ordered here. 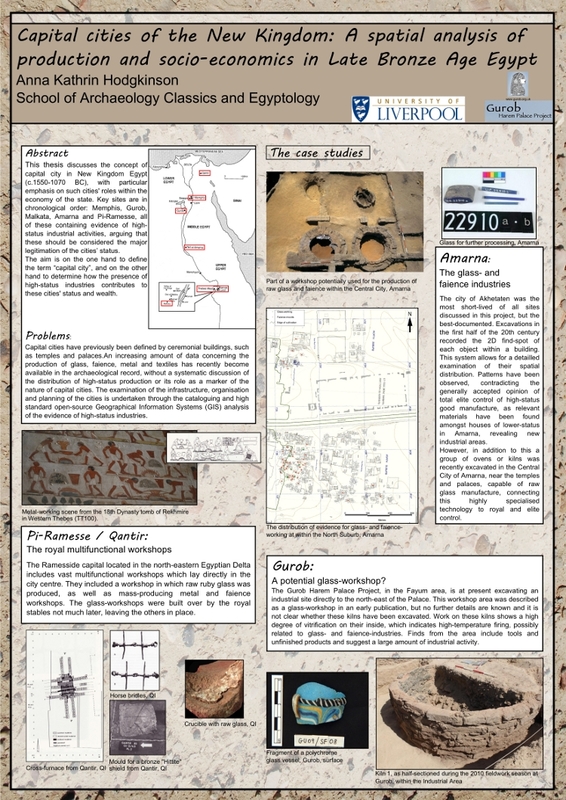 In order to establish how products and raw materials were controlled and distributed I produced and queried GIS maps, initially for well-preserved, relatively well-documented, almost purely single-period site of Amarna, but I have also been able to do the same for Gurob. During the course of this experiment I have been able to observed spatial clusters within the distribution of the archaeological evidence of production and also of finished objects. I have been able to isolate and interpret areas of concentrated industrial activity, emphasizing the fact that control over high-status industries was less tight than previously assumed. Following the defence of my PhD, in early 2014, I carried out a three-month postdoctoral fellowship at the British Museum Department of Ancient Egypt and Sudan, researching New Kingdom Egyptian glass jewellery, its manufacture and use. The idea for this research was built upon my interest in Late Bronze Age glasses and their manufacture, which developed during my PhD.